Home food Mang Inasal Mang Inasal Pork Sisig Why Mang Inasal's Pork Sisig is a must-try! Why Mang Inasal's Pork Sisig is a must-try! Mang Inasal is the go-to place for people seeking to satisfy their craving for a truly delicious Pinoy fare. With the options it offers in its tasty menu, you'll know that it has other mouthful treats other than Chicken Inasal. Aside from its flagship offering of the 2-in-1 sa Laki, Nuot sa Ihaw Sarap Chicken Inasal, Mang Inasal also offers Pinoy favorites such as Pork BBQ, Palabok, Lumpiang Togue, and Halo Halo. And since Sisig is one of the most popular Filipino dishes, Mang Inasal added it in its menu as well a few years back, to provide more choices to the restaurant’s ever-growing number of customers. The fastfood chain even improved the dish’s serving and taste throughout the years. A homegrown fare that traces its origins in Pampanga, Sisig was first defined in a Kapampangan dictionary in 1732 as a green fruit mixed with vinegar, salt, pepper and garlic. From being just a salad, Sisig has evolved over the years into a main dish with sizzling plate and chopped meat as its defining elements. 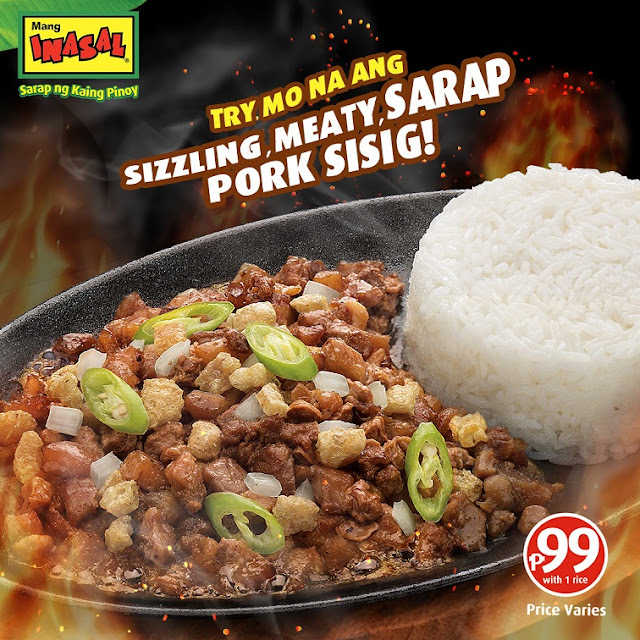 The Mang Inasal sizzling meaty sarap Pork Sisig is made of a generous serving of flavorful, tender and juicy pork chunks with yummy crunchy chicharon and tangy white onion. Offered as one of the fastfood’s Paborito Meals (PM) for only P99, Mang Inasal Pork Sisig comes with a cup of rice, and an option to have unlimited servings of rice. Mang Inasal Pork Sisig is perfect both as solo meal and for sharing with your family or barkada. And if you are more into seafood, there is also the Mang Inasal Bangus Sisig for you. Probably the most scrumptious and affordable Sisig in the Philippines, Mang Inasal Pork Sisig might just be the ultimate Pinoy comfort food you are looking for. Definitely a must try!